This simulation of emission plumes from five power plants in Baltimore, MD was created using emissions data from EPA, weather data for February 20, 2013, and software that models atmospheric dynamics. The simulation covers a 4-hour period and shows carbon dioxide concentrations within a horizontal visualization plane 100 meters above sea level. Although high-quality emissions data is often available from point sources such as power plants, such data is often lacking for distributed sources such as traffic corridors and urban neighborhoods. NIST is also working on methods for measuring these less intense emissions and modeling how they mix in the atmosphere. to measure. But as countries around the world work to reduce these emissions, decision-makers need real-time feedback on how well their efforts are working. For this reason, accurately measuring emissions is more important than ever. Today, most emissions estimates are calculated using indirect measures such as energy consumption. But NIST's Greenhouse Gas Measurements Program is developing standards and methods for measuring GHG emissions directly based on atmospheric observations taken from surface stations, aircraft and satellites. These two approaches—one based on energy consumption, one based on atmospheric observations—are complementary and will allow us to attack this complex measurement problem from two sides. Both approaches allow us to see whether we're making progress toward, and ultimately achieving, emissions reductions targets. Both also provide independent means of totaling national emissions inventories. But the traditional approach tends to break down results by economic sector on a yearly basis. Measurements based on atmospheric observations, on the other hand, are more specific to a place and time, and can attribute emissions to specific sources—something that can be very helpful when attempting to reduce those emissions. For example, city planners might change downtown traffic patterns to reduce the amount of time that vehicles spend idling in traffic. But how much do emissions actually fall? Near real-time GHG measurements based on atmospheric observations, in combination with more traditional estimates based on vehicle flow, will give the most accurate answer to that question. This combined approach will help decision-makers reduce emissions in the most cost-effective way. Because cities account for an estimated 80 percent of GHG emissions, they are an obvious place to focus emissions reduction efforts. For this reason, NIST has established three Urban Test Beds—areas where scientists are developing advanced technologies for directly measuring GHG emissions at the scale of an urban region, a city or even a single neighborhood. The three urban test beds established to date are the Indianapolis Flux Experiment, or INFLUX; the Los Angeles Megacity Carbon Project; and the Northeast Corridor Project, which stretches from Washington, D.C. to Boston. NIST is developing methods for measuring greenhouse gas emissions based on atmospheric observations taken from surface stations, aircraft, and satellites. 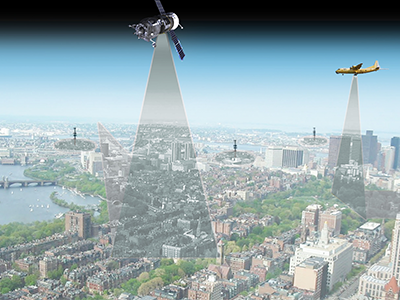 This illustration depicts the city of Boston, part of the Northeast Corridor urban test bed for greenhouse gas measurements. Within these urban test beds, we are engaged in research projects involving networks of automated, high-accuracy air sampling stations on towers, buildings and hilltops, as well as air sampling done from aircraft. Scientists working on these projects use this data to map GHG concentrations at local scales and to track how those concentrations change throughout the day and across the seasons. By combining air sampling data with atmospheric models, scientists can simulate the mixing of GHG emissions in the atmosphere. This allows them to visualize the flow—or flux—of GHG emissions into and out of the atmosphere at small spatial scales, and to attribute those emissions to specific sources such as individual neighborhoods, traffic corridors and industrial zones. These methods can also reveal what may be thought of as negative emissions—the uptake of carbon dioxide by urban forests and green spaces. In the future, satellite observations will play a larger role in measuring GHG emissions. As that happens, urban measurements will provide ground-truthing data for calibrating satellite measurements. Surface-based observations will also be able to measure emissions from many small sources over large areas. Unlike point-source emissions from power plants, for instance, emissions from smaller sources often produce a signal that is too weak to be picked up from space. Urban GHG measurements are just one promising area of research that our program supports. methods for measuring carbonaceous aerosols, also known as black carbon, which comes from the incomplete combustion of fossil fuels and plant material. Our program's success would not be possible without the collaboration of partners in private industry, academia and government. We work in close partnership with the NOAA Office of Oceanic and Atmospheric Research (OAR), Earth Systems Research Laboratory, with which we share a campus in Boulder, Colorado, and which we rely on for accurate measurements of atmospheric trace gases and atmospheric dynamics. We also collaborate with OAR's Air Resources Laboratory on modeling greenhouse gas dynamics in the lower atmosphere. The NIST Greenhouse Gas Measurements Program is working to develop new technologies for measuring GHG emissions directly, and for understanding how emissions interact with the atmosphere over small scales in space and time. This will provide businesses and governments with the data they need to find the most cost-effective ways to reduce their emissions. And as people work together to reduce emissions nationwide, it will provide us all with the information we need to know whether we are reaching our goals.